We have found out that Magnum Options has shut down their operations. Magnum Options has experienced rapid growth since its launch in 2013, becoming one of the top binary options platforms in the industry. In reviewing Magnum Options, we were particularly impressed by the degree to which they went to put their traders’ interests at a premium. Magnum Options is one of the only binary options brokers to offer not only a completely free account, but also a 10% return on trades which expire out-of-the-money. This means that traders are never left empty handed and get maximum value for their investments. These perks are in addition to highly favorable financial incentives. These include substantial payout rates of up to 81% and a 100% bonus for deposits of $1,000 or more. Magnum Options’ customer care team is highly professional and well-qualified to deal with all queries and requests. The site is highly navigable and user-friendly, with a simple trading process. 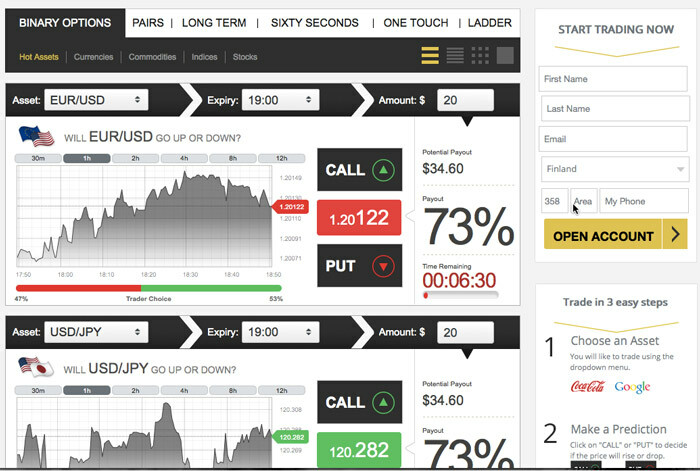 The platform’s ease of use is particularly appealing for those taking their first steps in binary options trading. Magnum Options offers 4 account packages, depending on the deposit invested. Each package varies in the features they offer and bonus amount rewarded. Mini Account starts at $500 investments and entitles clients to a 20% bonus, free market reviews and a copy of Magnum Options’ comprehensive eBook. This account suits those testing the waters before upgrading to gain access to greater trading options. The Standard package includes all the features offered in the Mini Account with additional tutorage in reading trading data and a bonus of 30% on their investment. Magnum Options also offers an Executive Account which gives its traders all the perks of a Standard Account in addition to expedited withdrawals, a personal account manager, academy membership and money management training. This package is perfect for traders who are relatively new to the field and are interested in earning sizable payouts. Gold Account holders gain full VIP Academy Membership for elite educational resources, same-day withdrawals, a dedicated account manager, 5 risk-free trades, 3 trading strategies and professional trading analysis to fine-tune their trading technique. The Platinum Account is the most exclusive package available, providing traders with an unbelievable 100% bonus, unlimited trading strategies and direct contact with a personal senior account manager via phone, Skype and email. Platinum package holders also enjoy same-day withdrawals, trading signals (like in binary robots) and access to daily trading groups to ensure their investments yield maximal returns. Magnum Options’ asset collection is highly diverse, with 150 tradable assets to choose from. It is also possible to trade in pairs, allowing investors to compare currencies like the USD/YEN or stocks such as Gold v Silver. This adds greater interest to the trading experience, especially in the case of major corporations such as Google v Apple, where current events and news releases have a direct knock-on impact on share prices. We were particularly pleased with the range of asset options available and believe that all trading interests are thoroughly catered for. Depositing funds and withdrawing profits is highly straightforward, with numerous options available for ease of use. Credit card users are spoiled for choice, as Magnum Options supports a wide range of brands, from the well-known favorites such as Visa and Mastercard to such less commonly accepted options including Diners Club and Amex. Traders can deposit funds quickly and securely into their account in dollars, sterling and yen. While withdrawals can take up to 3 business days to process, traders receive a free withdrawal every single month. Just like Banc de Binary, Magnum Options truly is a pleasure to trade with. With their excellent payout rates, substantial welcome bonuses and highly trained 24/7 customer care team, it’s no wonder traders have been flocking to sign up. If you’re looking for a trading platform which will give you more bang for your buck, you’re in safe hands with Magnum Options. 7 Binary Options review: Magnum Options: 4,5 stars. Aw shucks, why did they close down? ?